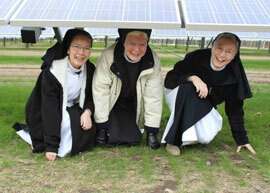 The story was in papers from Boston to Providence – the sisters of Mount St. Mary’s Abbey were celebrating and blessing the opening of the first of two solar field installations on their property! The event was graced with state and local politicians, and with the businessmen who had managed and overseen the project from start to finish, and flooded with local residents. This was a big story, and everyone wanted a piece of it. For some, it was the appearance of the politicians that was the draw. For others, it was that the Town of Franklin had made great strides toward their energy conservation goals, and had a newfound tax revenue stream to the tune of $300,000 a year. For still others, the curiosity of an obscure group of 40 some cloistered nuns who, once again, set records in leveraging green energy on their property. And for some, it was a celebration of thanksgiving to God for His great Providence. So, what IS the real story behind these Trappistine sisters and their green energy? Well, I guess that depends on your perspective. But for this writer, and outsider to the order, and a relatively new insider to the Trappistine Quality Candy organization, the real story is about God’s great Providence bestowed on those of steadfastness, faithfulness, and perseverance. It’s about a lifestyle pleasing to God that that has stood the test of time, and the fruit that this lifestyle bears. The prayer “Prosper the work of our hands” – Psalm 90 – comes to mind. In a world where immediate self-gratification and self-promotion seem to rule the day, it’s refreshing, even stimulating to see such clear evidence of God’s continued faithfulness to His promise and to His people, and that a simple, selfless, God-centered lifestyle can and does prosper. How many other organizations can you name that have been ongoing and spreading for nearly ten centuries – since 1098? Whose members subsist and even thrive by the work of their hands, not concerning themselves with maximizing profits, but rather with covering the cost of their simple lifestyle, and sharing in both times of need and times of abundance with the poor? The Sisters of Mount St. Mary’s Abbey have done all of that, by the grace of God, surviving and thriving with the changing seasons, years, centuries. A photo of the sisters strolling the lengths of the solar fields clad in their other-worldly habits, and sandaled feet portrays it all so clearly: this life of simplicity, faithfulness, and trust in God has real staying power! But their prosperity is in something greater than the financial prosperity by which he world measures it. The sisters have enough – truly, all that they want. But their wants are few, and their blessings are many. While the towns and companies reaped great financial benefits from the project, the sisters are counting their blessings, not their profits. They are thankful for having recognized the opportunity to preserve the environment, while making good, responsible use of the fields that they once worked as a dairy farm. And, for being able to retain and protect the nature and the peace-filled privacy that surrounds their cloistered world. Yes, they will benefit from the land lease for the solar panels. But after that 20 year lease, they will get their land back, and will have the option of restoring it to its natural state. A dual means of protecting nature and the environment: clean, solar energy for their town, while preserving healthy soil, and undeveloped land. Naturally, then, it follows that the sisters are interested in opportunities to leverage renewable energy on their land, and they have sought them out and followed through dutifully. And the revenue sources from these ventures have helped to offset the increasing utilities for their chocolate candy production, and for the abbey. “Living by the work of our hands is both a joy and a challenge,” adds Mother Maureen, head of the Abbey at Mount St. Mary’s. The sisters labor year-round, in between their hours of prayer, to maintain their property and run their candy business in order to be self-supporting, a hallmark of the Cistercian/Trappistine order. The Trappists are known here and abroad for their skill in beer, wine and cheese making. 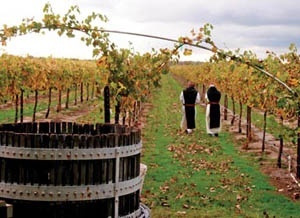 Here in the US, Trappist/Cistercian orders make wine, jams, creamed honey, breads, fruitcake, chocolates and other specialty items. And the most recent addition to this list is Spencer Trappist Ale, which is about to be released by the monks of St. Joseph Abbey in Spencer, MA. The monastery fields here in Wrentham were, in years past, worked as a dairy farm. Today the sisters support themselves through the fabrication of fine chocolates and other confections at their Trappistine Quality Candy factory on the monastery grounds. And the solar fields that were once used for silage are now gleaming with solar panels, set in rows like grapevines. On an adjacent field, rather than a silo, stands a lone wind turbine, laboring silently to produce electricity for the monastery. Using geothermal energy to heat and cool their building, and hosting both solar and wind energy on their property have been multi-faceted blessings. They give the sisters the joy of living in obedience to their faith life, help them offset their operating expenses, and benefit their neighbors, the Town of Franklin. All the while protecting their private, cloistered lifestyle where they can spend the majority of their waking hours in prayer and communion with God. “We didn’t plan it. It seems that this is the way that God is leading us,” says Sr. Alice Chau, a member of the Cistercian order of nuns at Mount St. Mary’s Abbey. “We did all these three [green energy projects] out of necessity.” Sr. Alice left her home in Hong Kong to join the abbey 20 years ago. She recently served on the steering committee for the solar field project. Along with Sr. Christa-Maria, who joined the order from Germany, and Sr. Bonitas from Korea, she also steers the order’s candy business. The sisters’ lives are based around prayer and work. They tout the three “L’s” as the three themes that define their lives and govern their days: Liturgy, Lectio Divina, and Labor. They rise at 3 a.m. daily, and pray in community (Liturgy) with one another 7 times each day. The balance of their time is spent in Lectio Divina, an individual, scripture-based, contemplative prayer, and, finally in Labor. Prayer rules the day, and the sisters cease work whenever they hear the abbey bells sound, signaling time for communal prayer. Their labor is chocolate making and is done in silent prayer. Therefore, when they say that their chocolates are “made with love and prayer”, they are being literal and true to their word. When you’re enjoying Trappistine Quality Candy chocolates, the sisters hope that you will also receive the love and prayers they offer each and every day for you – and for the world; prayer to which they dedicate their lives, and which has sustained them for centuries and will continue to sustain us according to God’s promise. And, they are grateful to you for helping them to financially support their life of prayer for the world. Maybe we can all learn something from the wonderful example of the Cistercian/Trappistine order: living life simply, faithfully, frugally, in prayer. Offering our work as a prayer as well as a means of supporting only our needs, not our wants; being simple in our needs, and respectful in use of the earth’s natural resources. So, now you have it; the REAL story behind the Trappistines – AND their green energy. Next Next post: Gave Up Chocolate? Break that Resolution!